Do I need a resistor on the base of a transistor? When I am connecting an IO pin of a microcontroller to the base of a transistor, do I need a current-limiting resistor between the IO pin and the base? Or can I just directly connect the pin? My thinking is that I can just omit the resistor because the microcontroller (attiny85 in my case) has an absolute maximum rating of 40mA sink/source for the IO pins, so it won't supply any more than 40mA to the base of the transistor. 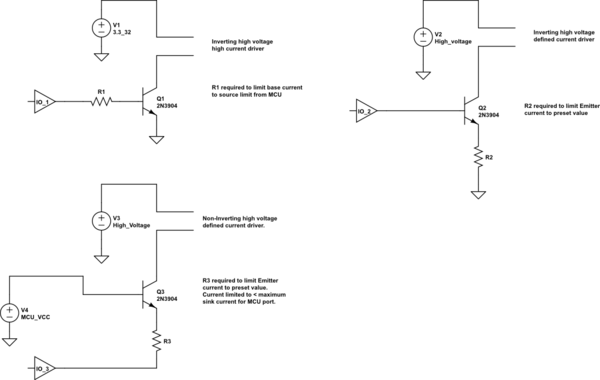 Do I need a current-limiting resistor between base of transistor and IO pin on microcontroller? If transistor is connected common-collector no resistor is needed. That 40mA is a promise you must make the the micro-controller, not the other way around. The answer is more complicated than a simple Yes/No. It depends on the configuration you use for the interface. MCU GPIO ports are typically NOT current limited. The specification will recommend the maximum Sink and Source current that your design should limit the current to. There will also be an absolute maximum specified that may include several ports. For example the AVRs used in the Arduino have an aggregate limit for groups of GPIO pins. The sink and source currents specified for the MCU may be different. The source current comes from the regulator for the MCU, and this may impose design restriction. Sink current does NOT necessarily come from the MCU supply, it may come from another supply within the design. Only one of the circuits REQUIRES a series base resistor to function. Not the answer you're looking for? Browse other questions tagged arduino microcontroller transistors current resistors or ask your own question. Why is base resistor of a transistor important? Can two microcontroller output pins play tug of war?